Growing up in my house in South Carolina, it was not uncommon to see my mother having a diet coke and a slice of pimiento cheese toast for breakfast. In fact, I'd wager many of my friends and their mothers ate that same breakfast but maybe with a glass of sweet tea. In New York, however, most people I know had never heard of pimiento cheese...until they met me. I started bringing this southern delicacy as my party food a couple of years ago, and the moment I draw back the sheath from my dish, the first question is always, "what is that?" I try to explain that it's not just cheese dip but rather a multi-purpose item that can be used as a spread for sandwiches, bagels, toast, or even as the cheese on your burger as well as having a nice texture for scooping, but usually everyone just comes out calling it cheese dip. The last time I brought pimiento cheese to a gathering, a girl spread it on a croissant, making a sandwich. The girl standing next to her said, "how creative!" If they only knew. People have been doing that down south for...well, I don't know how long. I am hesitant to tell everyone what's in this as I'm afraid you won't try it at all, but I'm telling you, it's always a huge hit at any party. 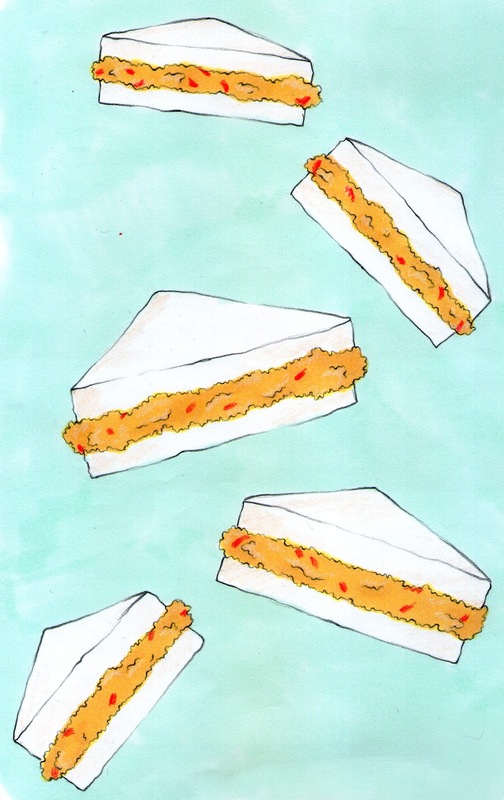 This particular recipe is pretty popular here in New York as it's got a little spice to it, but you should probably note that the most traditional pimiento cheese is without jalapenos or hot sauce. Without further ado, you may find below the answer to your next party-treat dilemma. 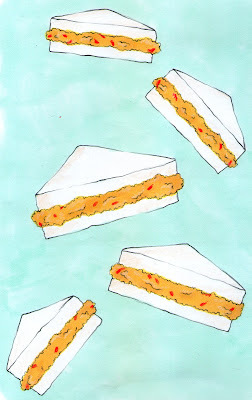 If you want to get real southern about it, you should make little triangular sandwiches with crustless white bread. Otherwise, just serve it up in a cute bowl with melba toast or bagel crisps. 1. Grate the two blocks of cheese into the large mixing bowl. 2. Drain the Pimientos and add them to the cheese. 3. Add a couple of spoonfuls or mayonnaise to the cheese and Pimientos and stir. Keep adding Mayo until the Cheese is spreadable but still a little chunky. 4. Add salt, pepper, garlic, cayenne pepper and Worcestershire Sauce. Stir. 5. Texture should be a little looser and more spreadable, but if it's still not to your spreadable liking, add more mayo until it is. 6. Add Tapatio, stir, and taste. Add more of any of the ingredients you think would make it better. 7. Once the mixture is finished, refrigerate over night. You don't have to do this, but it does get better with a night in the fridge. If you can't wait, you can serve immediately. Now you're ready to make sandwiches, use as dip, or whatever else you can think of!